This recipe is adapted from a recipe I found in Family Circle Magazine. Feel free to play with the amounts of rice, corn, or even spices – I’ve had to alter amounts when I didn’t have enough of an ingredient, and everything turned out A- OK. 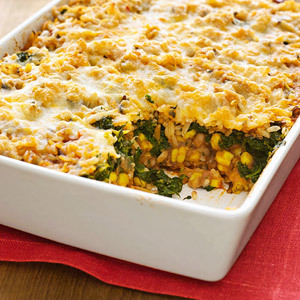 When you make it, be sure to double the recipe and freeze a pan for another quick meal!